A woman sits on the rocky shore in the town of Quirpon on the Great Northern Peninsula of Newfoundland as she spends her time iceberg watching. 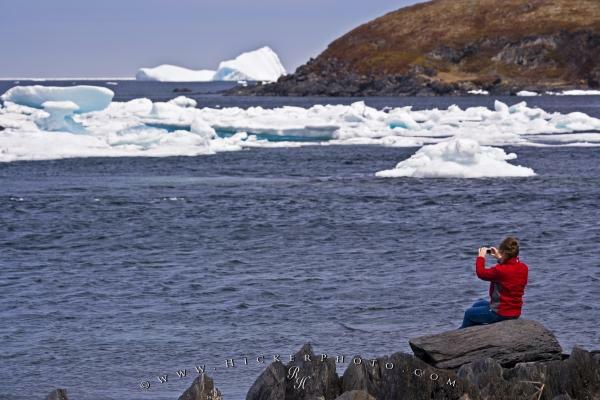 Photo of a woman iceberg watching and taking pictures along the shores of Quirpon, Newfoundland in Canada. ... The Labrador current makes the icebergs head south and Quirpon has the longest season around Newfoundland for iceberg watching.Iceberg watching is a main attraction in Quirpon, Newfoundland but you may also be able to spot a humpback, minke or Orca around the waters off this town. This is truly an area of nature's incredible creations and hours can be spent sitting along the Newfoundland coastline enjoying the scenery and wildlife.Woman iceberg watching from the shore in the town of Quirpon with pack ice in the harbour, Trails to the Vikings, Viking Trail, Great Northern Peninsula, Northern Peninsula, Newfoundland, Canada. Model Released. I photographed this photo with the digital SLR camera model Canon EOS-1Ds Mark II, aperture of f/10.0, exposure time of 1/125 sec. on ISO 100, as always I used a original Canon Lens, the focus lenght for this picture was 200mm.